Designed for small to medium construction firms, UDA ConstructionSuite 2011 combines estimating and project management with a construction specific CRM system to deliver the most comprehensive management system for construction professionals available. Already used by tens of thousands of construction professionals in 60 countries worldwide, UDA construction software delivers the new industry standard in project management for small to medium construction firms. 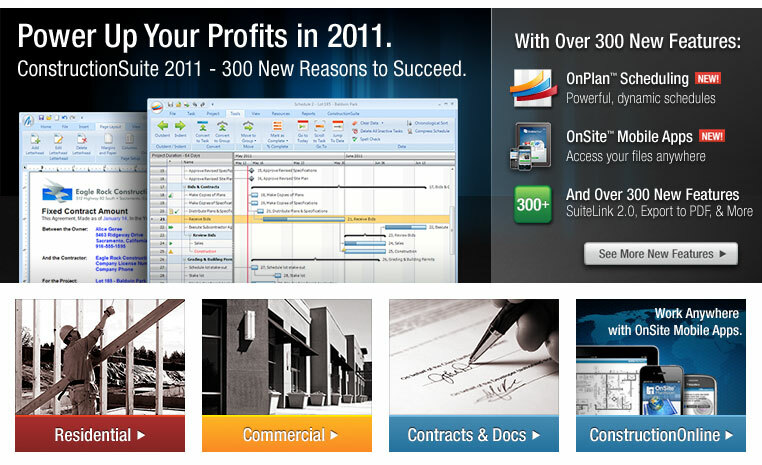 With fully integrated and completely upgraded Estimating, Scheduling, Contracts, Specifications, and Document Management, UDA ConstructionSuite 2011 also includes over three hundred new features designed to give users total control over their projects. UDA Construction Office� Homeowner provides simple and effective Construction Management, Contracts, Estimating, Accounting, Productivity Tools & Guidelines for Do-It-Yourselfers and Individuals Contracting or Building their own home. We've all heard the horror stories. Difficult situations, disputes and delays. By providing the tools to eliminate overrun budgets, stay on schedule and produce essential contracts and understandable documentation, UDA Construction Office Homeowner is powerful software you can use right now to successfully contract your new home. UDA Contracts for Homeowners include specialized "Hold Harmless and Indemnity" clauses to limit personal liability and present clear, concise terms, eliminating confusion and unwanted surprises. Do you use QuickBooks Pro? Construction Office� Homeowner is also available in a QT version which includes UDA QuickBooks Integration, designed to track construction costs on your project. Vague contracts are simple to execute but nearly impossible to enforce. Such agreements mean trouble if you don't keep control by insuring that each contract clearly defines expectations and protects you and your family from taking on liabilities and responsibilities that should not fall into your lap. UDA Estimating tools allow you to quickly estimate your construction costs, including materials, fees, labor, etc... It is virtually impossible to maintain project allowances and keep costs at a minimum if you don't keep up with every expense. UDA spreadsheet templates take the guess work out of the process, saving you the headache of an overrun budget. Preparation, well defined specifications, professional contracts and a thoroughly planned budget will give your banker the confidence to finance your new home. UDA Construction Office Homeowner provides the tools to take you through this critical step successfully. Next - Take the Construction Office Tour.
" First I want to say I am totally in shock! After months of countless hours spent reading books, buying books, buying videos, searching the internet and talking with other companies, this software (Construction Office Homeowner) is by-far the the best preparation home building informational software I have found anywhere! After downloading yesterday, I have been up all night, can you tell I'm excited? I have talked to builders, suppliers, architects and professionals to help me build this cabin, but I could never get the information your company provides. By the way... my past life, in Hollyweird, California was with NBC studios, Johnny Carson/Jay Leno show as Art Director, Set Designer and Builder... now I'm here to lead a dream life building a few homes. UDA Construction Office is designed as a companion product for Microsoft Office to provide you the Construction Administration Tools necessary to successfully tackle any project, including: Planning, Design, Estimating, Bidding and Contracting.